In order to help their customers better understand the cost benefits of switching to energy-efficient alternatives, Internet lighting retailer, 1000Bulbs.com, has created their own Energy Savings Calculator to accompany all compact fluorescent and LED lamps on their website. Earlier this year, the last phase-out of general service incandescent bulbs enforced by the Energy and Independence Security Act of 2007 took effect. Due to these incandescent bulbs no longer being produced by manufacturers, the demand for energy-efficient lighting that meets EISA standards is growing rapidly. Launched in January of 2014, the 1000Bulbs.com Energy Savings Calculator has the ability to show customers everything they need to know about the savings that comes with energy-efficient lighting. By taking the wattage of the individual CFL or LED replacement, the wattage of its incandescent equivalent, the number of bulbs being replaced, and the rate charged per kilowatt-hour, the calculator automatically computes the amount customers can expect to save over the life of a single CFL or LED. As the first online lighting retailer to have a calculator of this kind, 1000Bulbs.com is committed to educating consumers on the many positive aspects of upgrading to energy-efficient lighting. For customers who are looking for more in-depth savings analysis, the calculator can be expanded to show the total kilowatts and kilowatt hours saved per year, the total amount saved on energy costs per year, and the number of months before they can expect a payback on their investment. 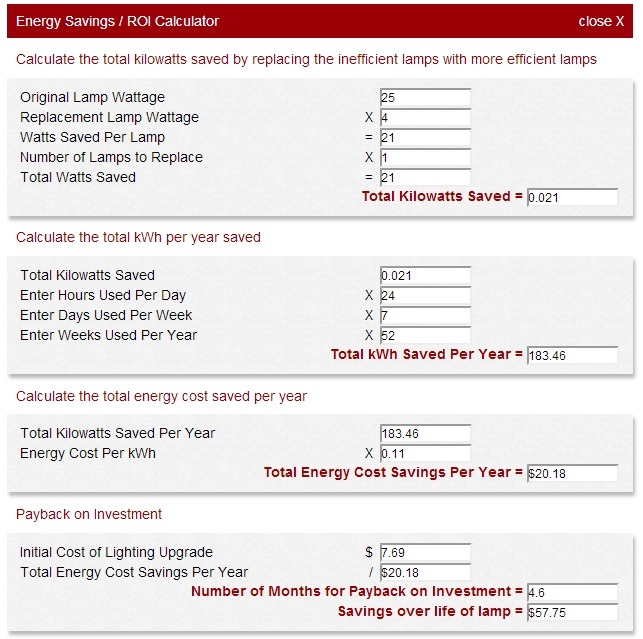 This Energy Savings/ROI calculator features customizable fields that can be adjusted to accommodate each client’s unique lighting needs and specifications. Although energy-efficient bulbs are typically more expensive compared to incandescent bulbs, they have been proven to last up to 50 times longer, consuming only a fraction of the energy used by their incandescent counterparts. While it used to take years, it now only takes a matter of months to see payback for the purchase of an energy-efficient bulb. The 1000Bulbs.com Energy Savings Calculator assures customers that the savings incurred over the life of an LED or CFL will more than make up for any initial and future maintenance costs. Feel free to leave a comment or reach out to us on Facebook, Twitter, Pinterest, Google Plus or LinkedIn!